Fire broke out at a well site in Weld County, CO. This is the second fire at a well site in a week. 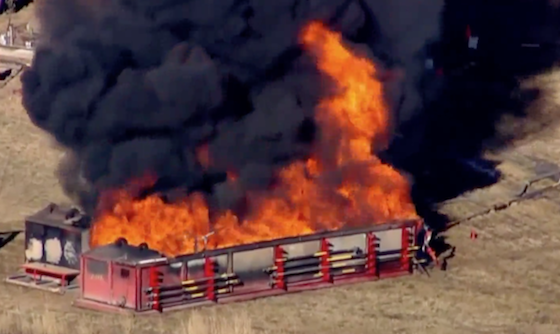 There was another oil field fire in Weld County this week, this time in Windsor, CO. In this instance, a tank at a Noble Energy site caught fire while crews worked to cap the 15-year-old well. Windsor Severance Fire Crews put the blaze out quickly. “We had plenty of time to set up our operations with water and foam and get that to lob over it,” said Windsor Severance Fire Rescue Battalion Chief Todd Vess. This fire is one of the latest in Weld County. There was a much larger fire and explosion at a different Noble site last week. And late last month an explosion at a Mallard exploration site storage tank injured three.